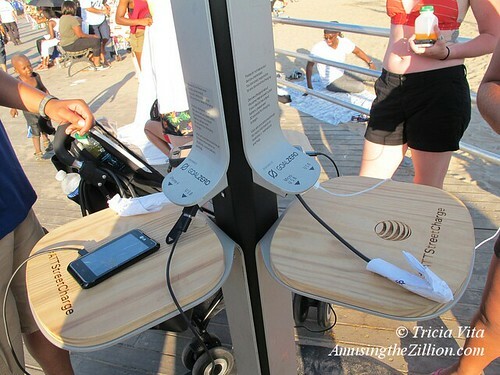 Post-Sandy public amenities on the Coney Island Boardwalk include this new solar powered charging station at West 8th Street. Known as Street Charge, the modular unit accommodates up to six devices at one time and will be here through October, Goal Zero’s Mark Olsen told ATZ. 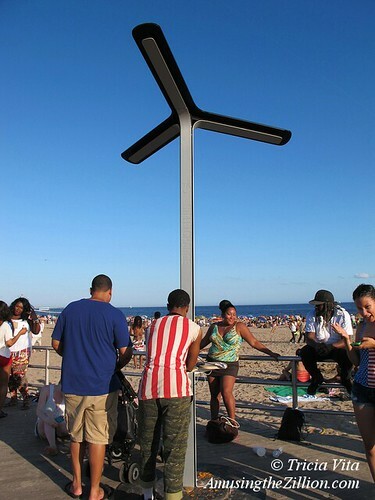 Industry leader in portable solar power Goal Zero teamed up with AT&T and Brooklyn design studio Pensa to bring the charging stations to New York City’s streets, parks and beaches. Additional locations include Brighton Beach, Manhattan Beach, and Rockaway Beach. Besides providing power, Street Charge will have the potential for lighting, WIFI, and signage for ads and way finding, according to Goal Zero. I was happy to notice this on the boardwalk recently. I had the idea for sponsored (Budweiser, etc.) large table umbrellas (for Ruby’s and such) that had solar panels feeding charger ports for the patrons. Since tables are for paying customers, it would be an added value type thing. Wi-Fi is next on my wish list!